For more than 20 years, Prosign Design has been partnering with schools across the nation to provide a safe and efficient solution to carpool line chaos. The afternoon carpool line can be one of the busiest — and likely most dangerous — times for students during the school day. However, with Prosign Design’s durable and easily visible carpool tags, school staff can confidently direct students to the correct vehicles and safely transition them from the school grounds back to their parents and guardians. Our customizable carpool tags include the school name, location, school type (magnet, year-round, elementary, etc.) and student number — all highly visible due to our enlarged font sizes (we recommend 2-inch numbers). They also include a rounded hook for hanging the tag from a vehicle’s rearview mirror and can be tailored according to your shape and color preferences. We are happy to work with you at no charge on a carpool tag design that will meet your unique needs. 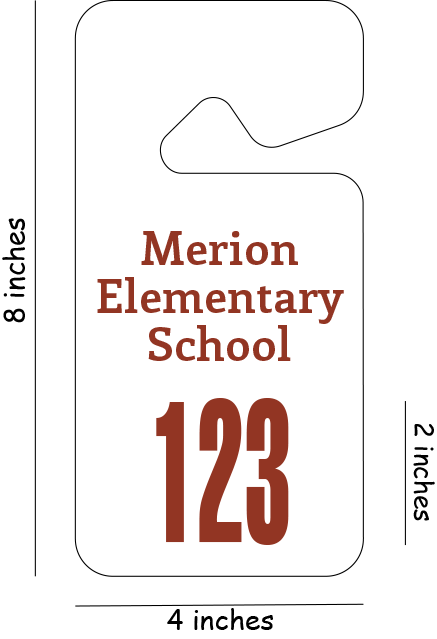 Each carpool tag includes a unique number assigned to a particular student. This efficient numbering system helps school personnel quickly identify where to direct students during “pick up” time. You will receive a free design mockup tailored to your unique specialty, shape and color preferences. Heavy-duty polystyrene and deluxe plastic ensure the long life of your carpool tags. When will my carpool tag order be ready? Production times generally range between seven to 10 business days, especially during peak ordering times (June 1–September 15). For parents wanting additional carpool tags, duplicate orders can be placed following an initial order. However, it’s strongly recommended that you order duplicate carpool tags in your initial order. There is a minimum order requirement of 100 carpool tags. You may pay using a purchase order as well as a credit card, a school check or PTA/PTO funds. At this point, we do not accept payment through PayPal. How many tags should we order per student? Yes, we accept duplicate orders of a minimum of 50 carpool tags. Will you help us with the design of the carpool tags? We are happy to assist you free of charge with designing your carpool tags. Carpool tags are an excellent choice for schools wanting to streamline the carpool line “drop off” and “pick up” process.